The Gay Gamer: I want to be a fishing master! I'm not sure why, but I've followed Hudson's Wii fishing game (Fishing Master) ever since it was first shown last year. I'm not at all a fisherman in real life, and the only time I've ever enjoyed fishing in a game has been in the more recent entries into the Zelda series. 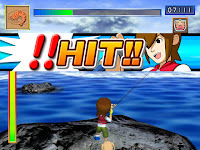 Regardless, I think Fishing Master looks quite enticing, and I hope Hudson considers bringing it to the U.S. (or maybe Konami will pick up their slack, considering they're bringing over Hudson's Kororinpa and Wing Island). Watch the trailer for yourself, then tell me if I'm right on the money or completely out of my mind.